Make a computer, learn what's inside, play with code. Spark a lifelong passion for computing and the arts. The Kano Computer Kit is a computer anyone can make™. You build and code it yourself. It’s a fun way to make, play and express your creativity with technology. What’s inside the Kano Computer Kit? The kit comes with 10 plug-and-play components including: a Raspberry Pi, a wireless keyboard, a DIY speaker, a custom case, power and HDMI cables, memory card, a USB power supply, an illustrated story book and 4 sheets of stickers. Do parents need to know about computers? No prior knowledge is needed. We provide a step-by-step storybook, the Kano Book to guide you. Is adult supervision necessary when playing with Kano? 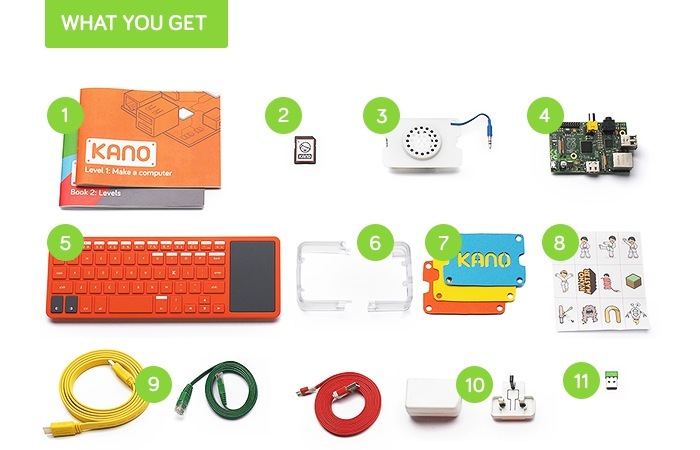 Some children between 6-8 years old may require parental supervision when reading the Kano Book and assembling the Computer Kit components. Children 8 years and older are proven to be quite self sufficient on their Kano! How do you actually code on Kano? Is Kano used in the classroom? Yes, Kano is being used in hundreds of schools across the US, UK, EU, Asia and even parts of Africa. Check out our educator’s page!